Did you know that over 80% of CSI members have collaborated or done business together? It takes a connected group of people to transform an idea into a solution. So, how do we make the most of the connections, networks and communities that surround us? 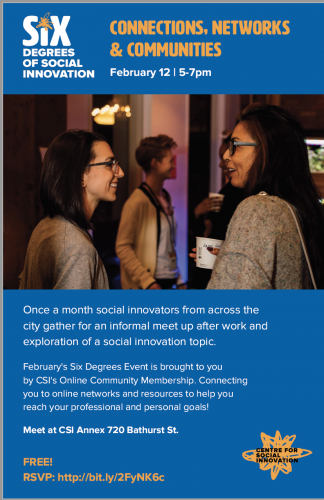 On Feb 12th join CSI Members: Anya-Milana Sulaver (Executive Editor of Peeps Magazine), Kallee Lins (Manager, Membership & Community at Imagine Canada), Noah Crampton (CEO of Mutuo Health Solutions and Project Manager of AutoScribe) – and more! Engage with the amazing Six Degrees attendees & faciliators, and make the right connections in a relaxed and fun environment.